Located on the shores of the Biollay Lake at the heart of the Trois Vallées ski resort, our teams welcome you to a warm, mountain chalet-style establishment offering a magnificent view over the Saulire mountain range. Featuring 127 spacious rooms with bal cony and wooden interior, the Mercure Courchevel hotel has 2 traditional restaurants, a bar, heated, outdoor, summer swimming pool and a convention center with 13 rooms equipped for the organization of events. Featured amenities include dry cleaning/laundry services, multilingual staff, and laundry facilities. Planning an event in Courchevel? This hotel has facilities measuring 861 square feet (80 square meters), including a meeting room. Self parking (subject to charges) is available onsite. When you stay at Madame Vacances Hôtel Courchevel Olympic in Courchevel, you'll be in the mountains, just steps from Courchevel 1850 and 11 minutes by foot from La Tania Ski Resort. This ski hotel is 3.1 mi (5 km) from Courchevel 1650 and 1.3 mi (2 km) from Courchevel 1550. This hotel is in the centre of the 3 Valleys ski area, 800 meters from Courchevel resort. It has a sauna, hot tub and a restaurant with panoramic mountain views. Club Vacanciel Courchevel offers comfortable rooms with TV and private bathroom. Bed linen, towels and end of stay cleaning are provided. A free baby kit can also be provided upon request. Club Vacanciel Courchevel also includes a bar and its restaurant has a large south-facing terrace overlooking the slopes. This hotel also features a fitness centre, games room and child care services, which are available with an extra cost. There is also heated ski locker room and ski storage. Club Vacanciel Courchevel is a 2-minute walk to the slopes. Free private parking is provided and Wi-Fi internet access is free in the bar and restaurant. When you stay at Hôtel Le Palace des Neiges in Courchevel, you'll be near ski lifts, a 1-minute drive from Courchevel 1850 and 5 minutes from La Tania Ski Resort. This 5-star hotel is 4.2 mi (6.7 km) from Courchevel 1650 and 2.3 mi (3.7 km) from Courchevel 1550. The hotel is situated in Courchevel 1550, directly linked with Courchevel 1850 by gondola (4 minutes from the Croisette). It is near the heart of the village and the ski lifts are 100 m from the hotel via the ski slopes or a 5-minute walk away. Guests will find restaurants and bars within around 300 m. The nearest bus station is around 200 m away, and there is a railway station around 2.5 km from the hotel. Lyon-Saint Exupéry Airport is around 160 km away. This charming ski hotel was renovated in 2010 and offers a total of 32 rooms. Guests are welcomed in a bright and cosy lobby with 24-hour check-out service. Facilities at this establishment include a hotel safe, newspaper stand, wireless Internet access, a bar and room service. Those arriving by car may leave their vehicle in the hotel car park or garage (fees apply to the latter). Rooms feature local stone and wood, creating a cosy atmosphere. Guests are sure to enjoy the tranquillity of the comfortable rooms with balconies over-looking the mountain. All are en suite with a shower, bath and a hairdryer. In-room amenities include a direct dial telephone, flat-screen satellite TV and wireless Internet access to help guests stay in touch with the rest of the world during their holiday. A safety deposit box and individually regulated heating also feature as standard. The relaxation centre is open all day long and includes a sauna and hammam, a hot tub and a hydrotherapy shower. There is also an on-site physical therapist offering a range of massage treatments upon request. The restaurant welcomes guests every evening in a romantic and intimate atmosphere, dimly-lit by oil lamps and surrounded by peaceful snowy fir-trees. Meals are available à la carte. When you stay at Hotel de la Loze in Courchevel, you'll be near ski lifts, just steps from Courchevel 1850 and 12 minutes by foot from La Tania Ski Resort. This ski hotel is 3.2 mi (5.2 km) from Courchevel 1650 and 1.4 mi (2.3 km) from Courchevel 1550. Take time to pamper yourself with a visit to the full-service spa. Skiers will be in heaven, but there are recreational options available for non-skiers as well, including a sauna and a fitness center. Additional features at this hotel include complimentary wireless Internet access, concierge services, and ski storage. Make yourself at home in one of the 41 guestrooms, featuring kitchenettes with refrigerators and stovetops. Flat-screen televisions with satellite programming provide entertainment, while complimentary wireless Internet access keeps you connected. 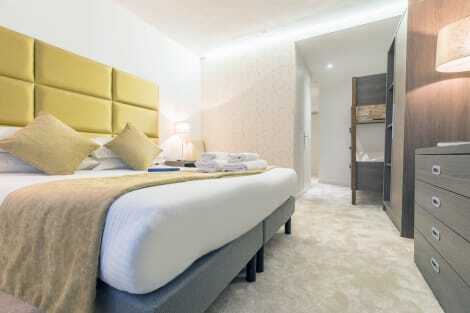 Conveniences include complimentary weekday newspapers and microwaves, and housekeeping is provided weekly. With a stay at Snow Lodge Boutique Hôtel, you'll be centrally located in Courchevel, a 1-minute drive from Courchevel 1850 and 12 minutes from Courchevel 1650. 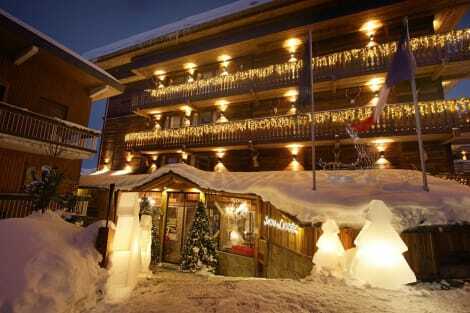 This 4-star hotel is 1.3 mi (2.2 km) from La Tania Ski Resort and 1.8 mi (2.8 km) from Courchevel 1550. When you stay at Alpes Hôtel Pralong in Courchevel, you'll be near ski lifts, a 1-minute drive from Courchevel 1850 and 7 minutes from La Tania Ski Resort. This 5-star hotel is 3.9 mi (6.3 km) from Courchevel 1650 and 2.4 mi (3.8 km) from Courchevel 1550. Courchevel is part of the wider Three Valleys region of France – the largest connected skiing area in the world. It's a classy, refined resort within the French Alps, claimed to have attractively short queues for the ski lifts. At the last count, there were 11 Courchevel hotels with a 5-star rating. When France introduced a sixth star for truly outstanding ‘palace' hotels in 2011, only around eight or nine hotels in the country met this standard. Two of them are in Courchevel's lush and green Jardin Alpin district. There are more affordable and budget hotels on the other end of the scale, found lower down the mountains. The area of Courchevel includes several small towns known for their ski chalets and slopes. Each was originally named for its altitude above sea level: 1300, 1550, 1650 and 1850. The towns were renamed in 2012. Courchevel 1300 is also known as Le Praz, and hosted the ski jumping contests at the 1992 Olympics. It marks the end of the alpine ski route down from Courchevel 1850, which is more commonly known as just Courchevel. The higher number of green and blue difficulty level ski runs at Courchevel 1650 (Moriond) makes it popular with families. There are also ski and snowboard schools to get you up to speed. Skiing is the main attraction, yet the resort offers plenty to keep the whole family entertained. If you fancy coming down the mountain through the air instead of on land, book a hang gliding or paragliding session. Go bowling at Bowling 3000 in Courchevel 1850. The lanes have special bumpers for the kids. Other indoor activities include the Plaza du Forum Olympic ice rink and foreign language classes. The spa experience in Courchevel is not to be missed. Relax après-ski in a heated pool or outdoor hot tub. Most of the high-end hotels also offer massages, hair and beauty treatments and a sauna. Courchevel boasts the most Michelin-starred restaurants – and the most stars overall – of any ski resort. Le Chabichou has held its two stars since 1984. Inside the pair of crisp white chalets, the service is discreet and the food is simply incredible. As with the shops, hotels and other attractions, prices for food drop with the altitude. L'Eterlou in Courchevel 1650 offers pizza that's a little less posh.